2. 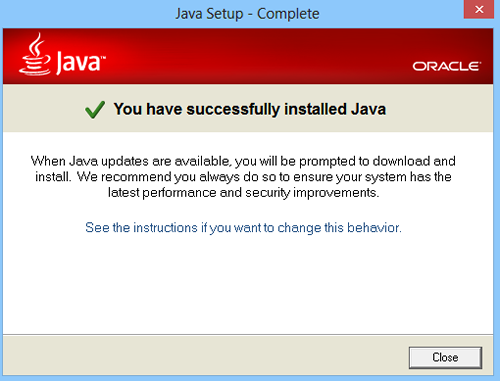 Click the big red VERIFY JAVA VERSION button. (Note, if you’re on Windows 8, you’ll need to be in Desktop mode). 3. Wait while the page checks your Java version. 4. If you have the latest version, you’ll see a green check and a “Congratulations” message …. … if not, you’ll want to click the big red AGREE AND START FREE DOWNLOAD button to get the latest version. Click SAVE FILE, then choose a location on your computer where you’ll be able to find the file when your download is done (we recommend the DOWNLOADS folder). Once the file has downloaded, locate it on your computer, then double-click to run it. If you’re using Internet Explorer, a yellow bar will appear across the bottom of the screen asking whether you’d like to save or run the file. Choose RUN. 6. A SETUP WELCOME screen will open. Click the INSTALL button to begin the installation. 7. 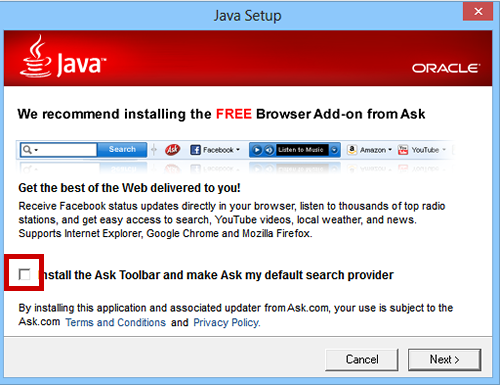 The setup will recommend you install a “free toolbar” or other add-on. You don’t want to do this. MAKE SURE YOU UNCHECK THE INSTALL BOX ON THIS PAGE BEFORE CLICKING NEXT. 8. Let the installer run. It may ask to close down your web browser, if it’s still open. Let it close your browser. When the installation is complete, you’ll see a SUCCESS message. Congratulations! 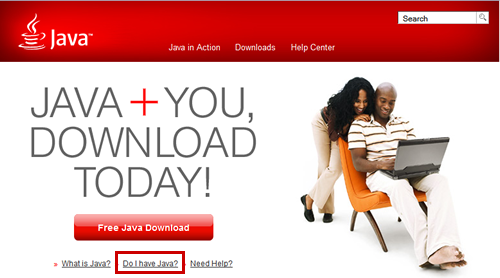 Your Java is now up to date!